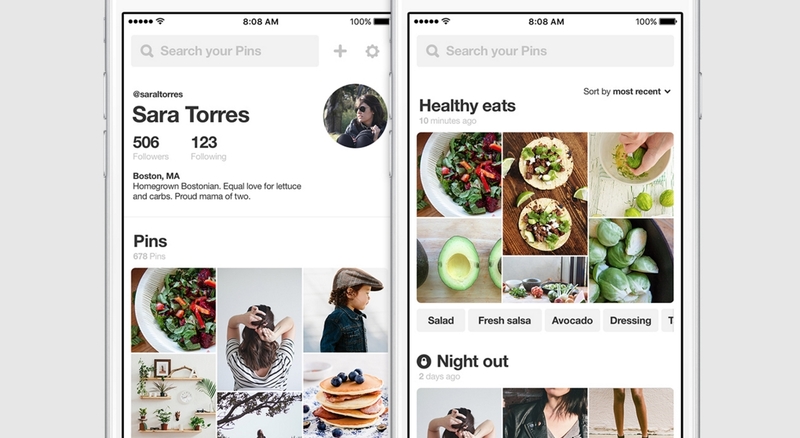 Pinterest is rolling out an updated mobile profile making it easier for users to get back to pins. It’s the first time they’ve updated the profile since 2013, and it has made things faster and easier to find pins while they’re on the go. According to the company, 80% of Pinterest users use the app on their mobile device. With the new profiles, recent pins and boards you’ve saved to are now at the top of the profile, and they can be sorted in alphabetical order. According to the company, they’ve heard from literally thousands of people that they’d like to be able to sort this way and to have a better way to find pins within their boards. As with much of what Pinterest announces these days, search is front and center with the new profiles. According to the company, early tests have shown that users who search their own pins are searching doing so 70% more with the new profiles. The number of those searching their pins in general has increased by 75%. Another element of the new profiles is that pins you’ve liked will automatically go to a board called “Your Likes” as the “likes” tab has been eliminated. Additionally, board covers are now a mosaic of your 6 most recent pins, and the profiles, designed for mobile, are just faster in general. According to Pinterest, people in early test have revisited their pins more often with the new profile. The new profiles are rolling out on both Android and iPhone.